Please refer to our stock # 7527 when inquiring. From an early age, Glushakow was encouraged by his parents to pursue his artistic talent. He studied at the Jewish Educational Alliance (JEA) and Maryland Institute before graduating from Balti-more City College in 1933. Following graduation, he was awarded a scholarship from the JEA to study at the Art Students League in NYC. At the Art Students League, he had the great fortune to study under Kenneth Hayes Miller, Charles Locke, and Alexander Brooke. Brooke encouraged Glushakow's growing interest in the portrayal of urban landscapes. Even the advent of WWII did not stop Glushakow's work as an artist. While serving in the Air Corps, he had works published in Art in the Armed Forces, GI Sketchbook, and LIFE Magazine. 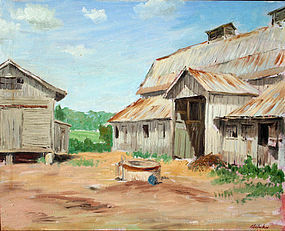 Following the war, Glushakow continued his painting. He also taught painting and drawing at the Jewish Community Center in Baltimore. His work was widely exhibited, though primarily in the local area. Among the venues to host his works were the National Gallery of Art; Baltimore Museum of Art; Virginia Museum of Fine Art, Richmond; National Academy of Design, NYC; and the Corcoran Gallery among others. His work was highly sought after and collected. In addition to many private owners, Glushakow's work is held in the permanent collections of the Baltimore Museum of Art, Baltimore Friends of Art Collection and the Phillips Collection. from: "Who Was Who in American Art", Falk, Peter Hastings, p. 1305. Additional information provided by the Estate of the Artist.